The New Hartsyard 2.0 Is Here & It's Nothing Like It Used To Be! 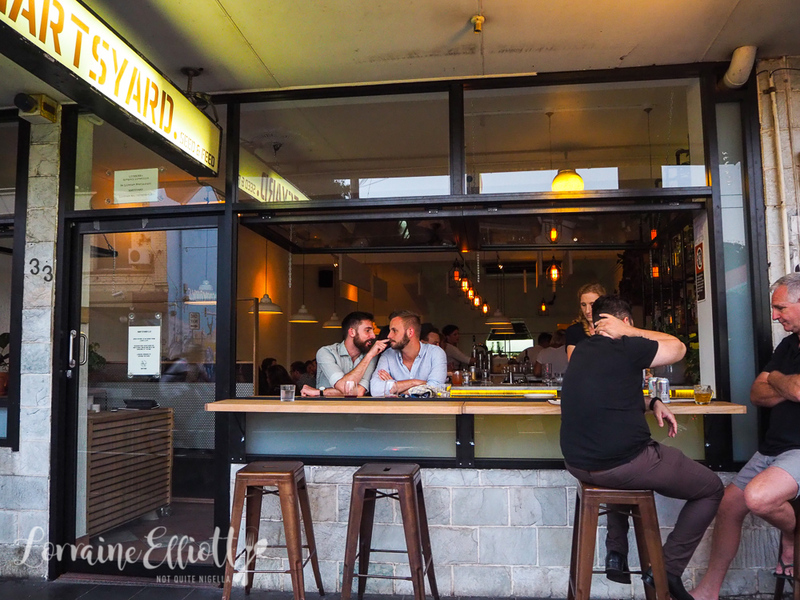 Hartsyard is back and everything is different! 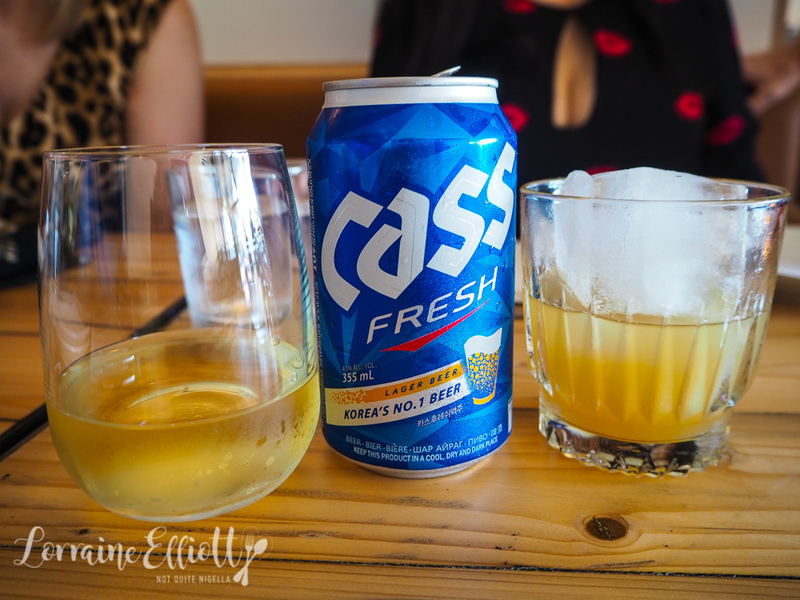 Gone are the classics like the fried chicken, poutine and soft serve. Hartsyard 2.0 is something very different indeed. So what is it like when a much beloved restaurant turns things around? Naomi Hart from Hartsyard now looks at her email inbox with a measure of trepidation. You see when Hartsyard announced that they were stripping down the walls and changing things up and their classics like the fried chicken were being taken off the menu, things got a bit scary. 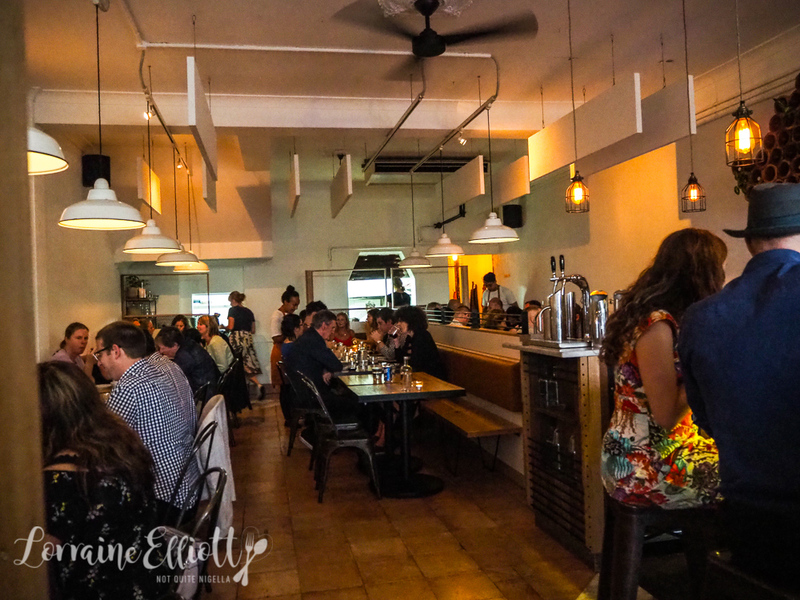 It appears people really love their fried chicken and the popular Enmore Road restaurant have received hate mail full of explosive vitriol about the removal of said dish. The transformation has been ticking around in the back of husband and wife team Gregory Llewellyn and Naomi's minds for a couple of years. But it wasn't until this past November 2017 when they decided to put the plan into action. 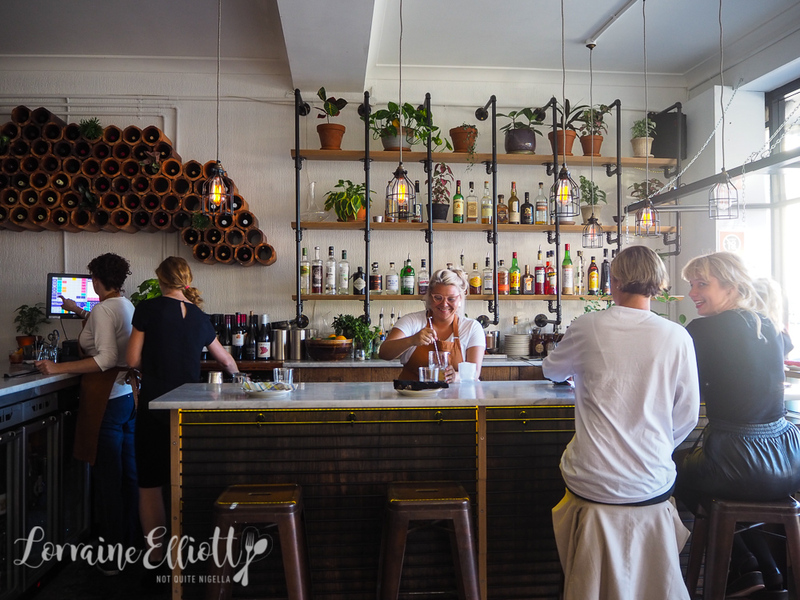 December at Hartsyard was full of people farewelling the old menu as the favourites were revived for a final curtain call and by the second week of January things were entirely new. The front of the restaurant has opened up with window bar seats as well as bar seating by the inside bar. The space is lightened up - gone are the topographical maps and in their place are white textured walls. We are dining with our favourite Americans Ivy and Ryan. I choose a drink from a list of five original cocktails. The Honey Bunny sounds like my sort of drink. 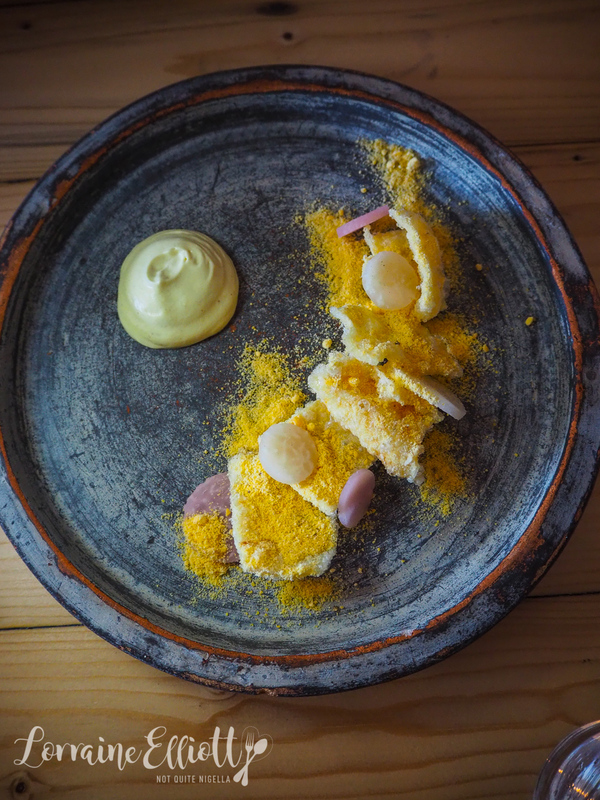 It's got everything I like: rye, creamed honey, salt and lemon verbena. It's strong and smooth and kind of like a liquid butter menthol. Oh and did I mention that it was strong? Because after a few sips I blurt out "It's so strong and smooth, like a maaaan!" to which Ryan quips, "And salty too!". The menu has 12 savoury items and we get Naomi's recommendations on the best picks. The cheddar puffs are the first to arrive. Naomi describes them as Gregory's vegetarian take on Reuben sandwich flavours. The cracker is cloth bound Cheddar mixed with tapioca and water. The dough is then steamed, dried and fried. On top of this are slices of fermented Kohlrabi. It's served with a dollop of warm sauce made of dijon, horseradish, buttermilk and sour cream. And the cheese spice sprinkles are made of dried gouda and classic pastrami spices like fennel, black pepper, chilli and brown sugar. I want another just as I finish my last bite of my current one. The cheddar powder is like magic dust. 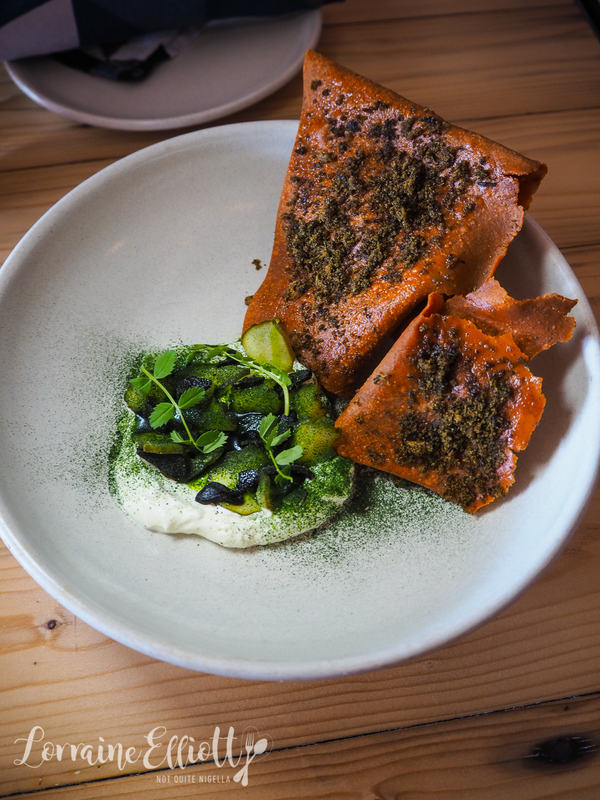 The chickpea cracker is super crisp and served with labne topped with cucumbers and black garlic. Ryan is smitten with this while Ivy waxes lyrical about the tangy labne. And you know I couldn't help but add some of the cheddar powder on it too (it works, but cheddar powder would work on anything savoury really). The scampi or prawn tartare is a two part dish. 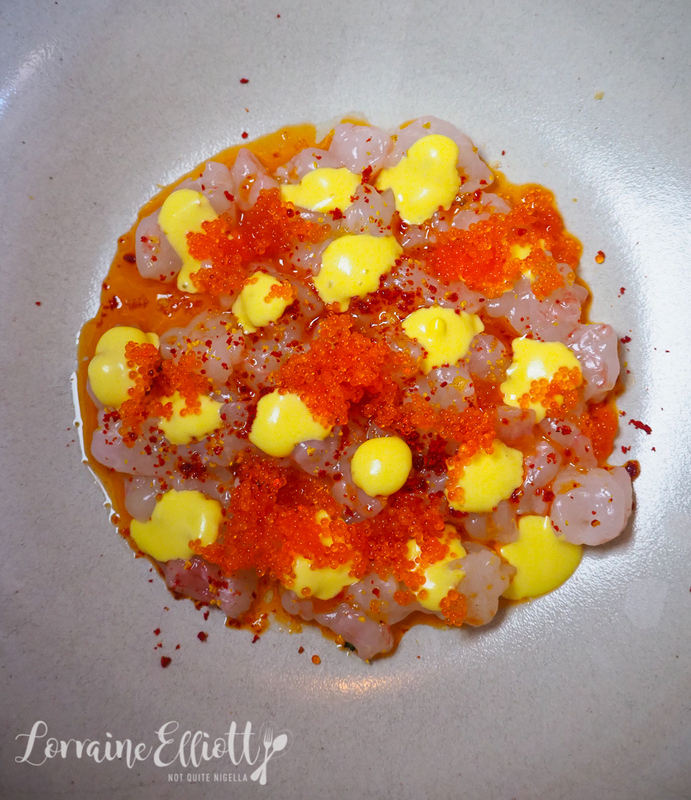 One plate has the lusciously creamy chopped prawn tartare topped with saffron rouille, orange and piquillo pepper and tobiko. The other bowl holds potato chips topped with salt and vinegar powder which are ridiculously addictive in themselves. I'm convinced that if they sold the chips or the powder they could amass a small fortune in sales. The scampi has the flavours of a bouillabaise because of the saffron rouille but with a creamy texture. We ordered the radicchio as Naomi had recommended this paired with the pork neck. Except that this came out earlier than the pork neck and the boys polished off their share. This prompts Ryan to order another portion which is a good idea. This is one of the surprise favourite dishes. Usually bitter radicchio can be a bit polarising but here it is paired with sauerkraut, cacio cavalo cheese, labne and roasted garlic. And it's so full of flavour, the combination giving it an almost meaty and bold flavour and it's well balanced that you could see it go with a lot of other dishes too or just eaten alone. 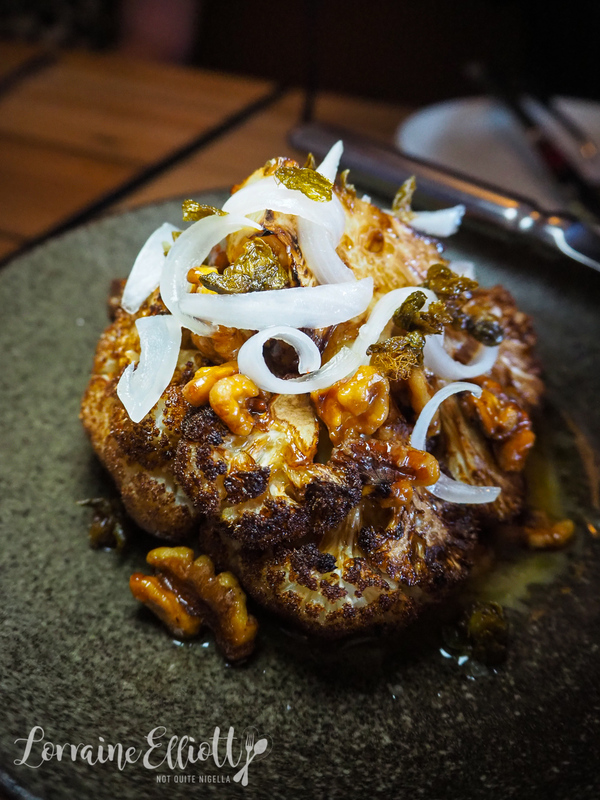 The cauliflower is roasted until dark so that the sweetness intensifies and it is served with smoked anchovy, roasted walnuts, lemons and capers. It's especially good when you get a little bit of everything in a mouthful. Then the pork neck and the corn arrives along with the second serving of the radicchio. The pork neck is brined for 24 hours and then slow cooked for 8 hours with koji fermented rice and then barbecued whilst being brushed with maple and koji. 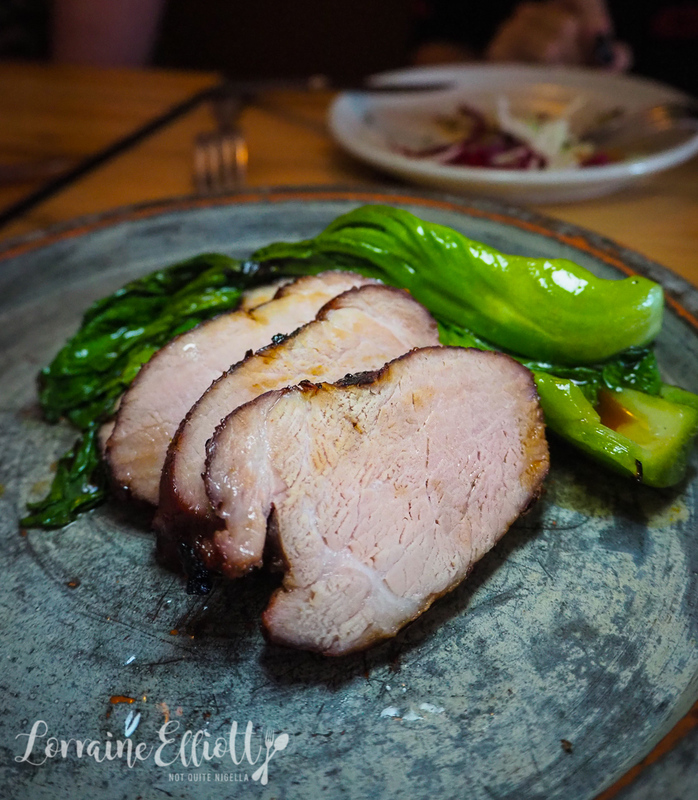 The mustard greens on the side are steamed and then kissed on the coals and then dressed with mustard oil, pork fat and pork jus. 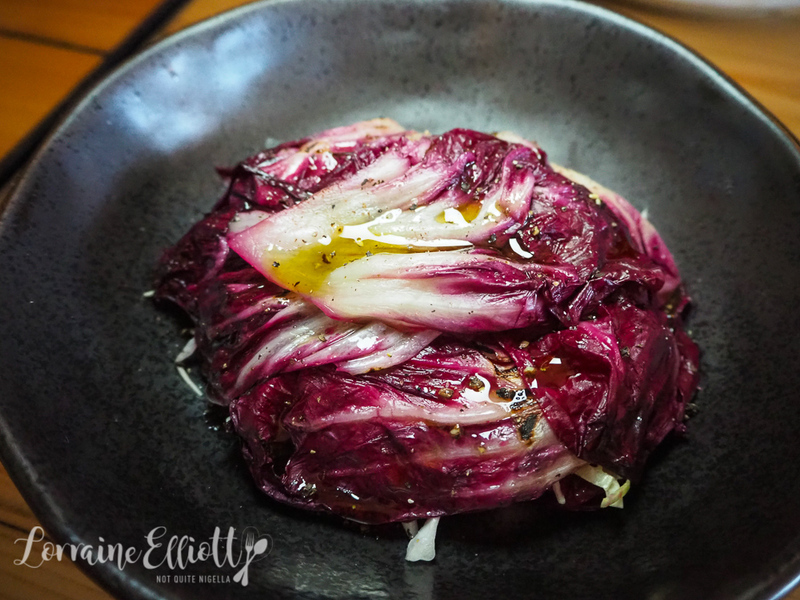 The pork neck comes sliced into 6 pieces and it is just perfect with the radicchio above. We actually stop talking while we are eating the two together only pausing once to murmur appreciation. They explain that the corn is meant to be a summery dish, hence why it isn't served hot. 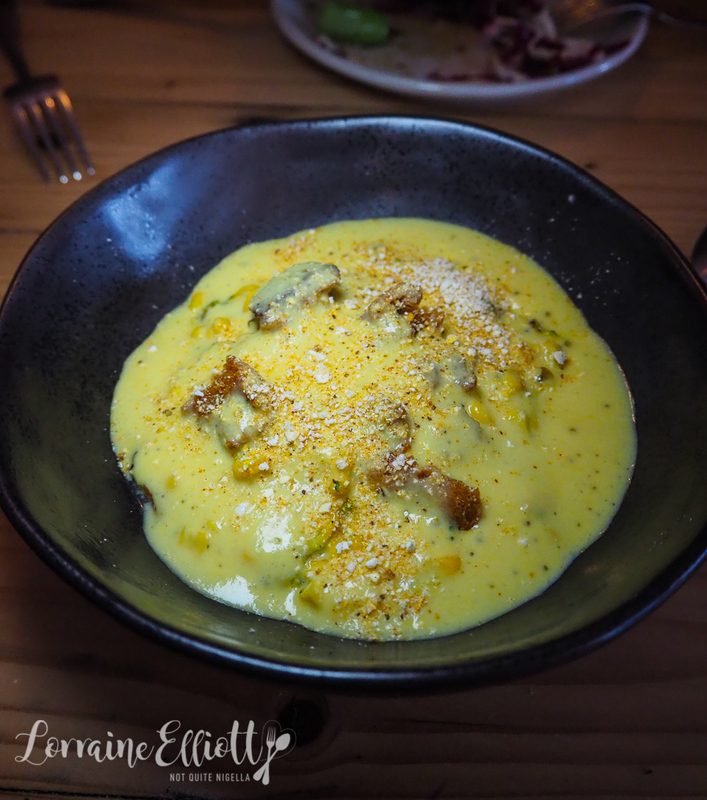 It's the sweetest of sweet corn with fresh cheese curds similar to stracciatella and a warm aerated corn sauce. The corn stock is made from corn cobs and kombu (seaweed). Then arragon is steeped in the broth and they season it with Tasmanian miso. On top there is some Old Bay seasoning and sourdough croutons that give the creamy, sweet corn a good crunch. 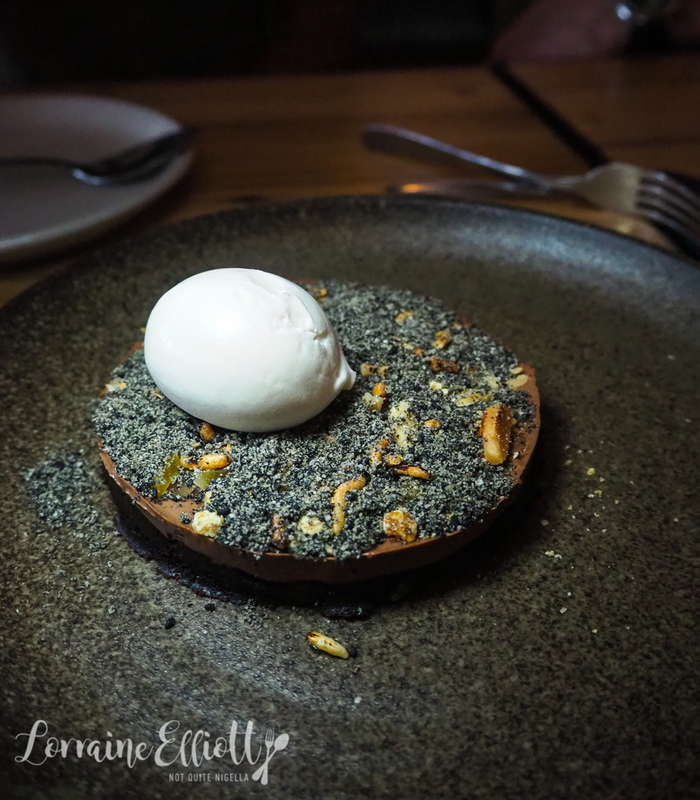 While we would have loved to have kept eating more of the main menu, we moved onto dessert. The dessert menu too is pared down to two choices so naturally we have to try one of each. 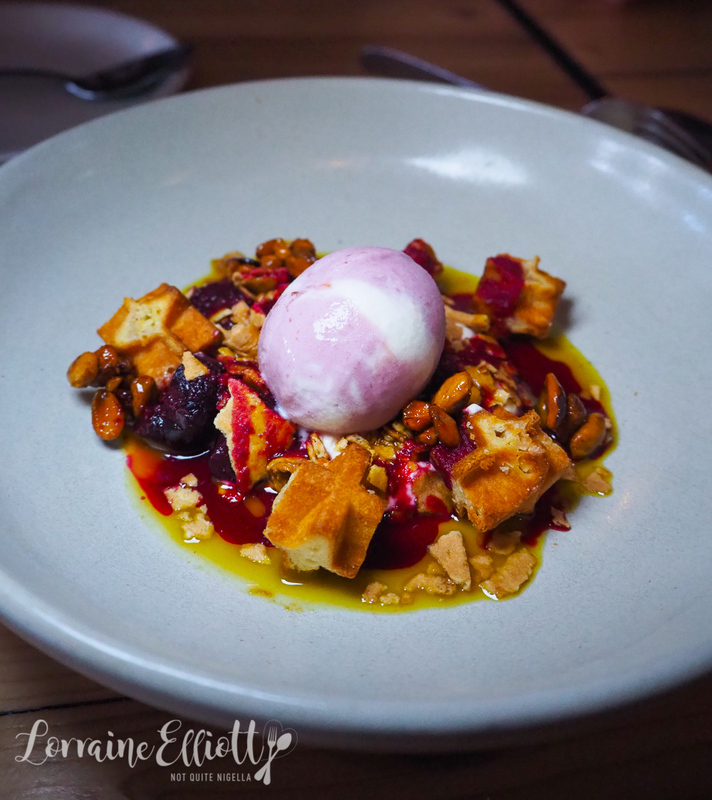 The cherry dessert is fresh cherries, sour buttermilk, pistachios, waffle pieces and cherry blossom ice cream. It's that wonderful combination of fruity and creamy. So tell me Dear Reader, what do you think when a restaurant changes? And have you ever written someone hate mail? Or have you ever written a restaurant the opposite i.e. praise mail?